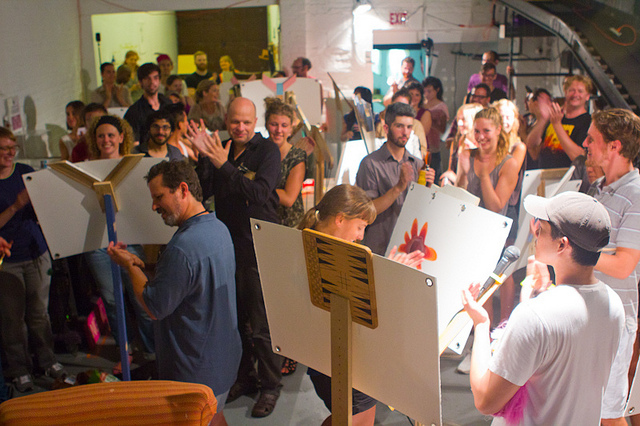 Flux Factory announces an open call for our 2014 exhibition season! Flux expands the creative experience beyond the typical gallery setting, using our exhibition space and the public realm as sites for critical intervention. This approach has helped Flux build a reputation for being inventive, risk-taking, and playful, while supporting the creation of new collaborative work and serving as an access point for audiences to experience the multidisciplinary creative process. Please visit our 2013 group exhibitions for reference: Wonder Cabinet, Kitty City, Untitled (As of Yet), and Log!c ?stem. To apply for any of the exhibitions listed below, email exhibitions@fluxfactory.org with the exhibition title in the subject line and attach a single PDF containing your project proposal, support sketches or images (max 5 images or 5 minutes of video), examples of similar work (max 5 images or 5 minutes of video), your resumé or biography, and website URL if you have one. See individual exhibition descriptions for deadlines, notifications, and additional requests for relevant info. If you wish to apply for more than one exhibition, please send a separate email for each and make your application specific to the exhibition. Making use of an underutilized outdoor space in our Long Island City neighborhood, this coming June, Flux Factory invites artists to develop installations and light-based work, temporarily transforming and illuminating the selected area at night. Artists, builders, educators, urban theorists, covert geologists, and circuit benders will be asked to work collectively to realize this project, through a series of group meetings and brainstorms. The driving force behind Nightlight is to create a space that is playful, engaging, and exciting to discover, while actively serving those who use the area as a passageway after dark. As this is an outdoor installation, we are especially interested in work which makes use of solar power or other alternative forms of energy, and will hold up against the elements. In your project proposal, please also tell us about your favorite secret spot in NYC. Applications are due February 17th and applicants will be notified by mid-March. Hello Fluxers near & far! Flux turns 20 years-young on August 1st. To celebrate this momentous occasion we invite all former and current Fluxers to send proposals for a show that is half exhibit/half class reunion, and all Fluxy-style. The entire building will be covered floor-to-ceiling with artworks, ephemera, relics, treasures, trash, and collectively-produced projects from all three Flux Factories. Film screening–let us know if you made a film at or about Flux. We’d like to have a film screening/sleepover marathon. Banquet–we’ll throw an incredible feast with a comedy roast, to honor our penchant for organizing around food. Archives–do you have an incredible piece of Flux history? We’ll enshrine it. Opening ceremony–if you’d like to speak, perform, or Flux yourself another way on August 1st, let us know! Committee–tell us if you’d like to be on the reunion committee by helping to plan and promote this extensive endeavor. For those who would like to contribute but have never been a resident or exhibiting artist at Flux, we are also requesting proposals for related events and projects that are central to core Flux values, such as the history of alternative art spaces in NYC, collectivity, and anything else that contextualizes Flux as part of a larger and enduring movement. Homecoming is an opportunity to learn more about how we have shaped each other through the choices we’ve made as a community and through our association with an organization we’ve collectively created over two decades. It is an ode to the thousands of people who have contributed to Flux’s 20 years of survival against all odds: artists, musicians, administrators, residents, drifters. In your application materials, tell us why your proposal is significant to you or Flux. Most importantly–pass this on to other Fluxers you are in touch with. Applications are due April 1st. We’re co-developing Utopia School, a new learning project with people who want to share information about both failed and successful Utopian projects and work towards new ones. For us, utopias are those spaces and initiatives that re-imagine the world in some crucial way. Together we will engage and connect local experts in urgent conversations while building something tangible together. The goal of these connections is to help accumulate collective knowledge from one locale to another throughout the duration of this multi-city project, into a comprehensive database and open curricula on utopian thought and practice. This will include physical places and relationship dynamics involved, as well as systems of organizing, political context, common roadblocks, and the methods used to create and sustain these projects. For our Fall 2014 Session in New York, Utopia School will create a literal schoolhouse in Flux Factory. The school will incorporate a series of theoretical and practical workshops, field trips, screenings, talks and games, and will house a group of dedicated participants, as well as the digital Utopia Library. We are seeking collaborators who may take on one or more roles including Makers, Builders, Artists, Theorists, Writers, Documentarians, Researchers, Archivists, Learners, Remote Correspondents, Support Staff, and other roles we may have not yet envisioned. Deadlines for submitting proposals to the school are April 15th, June 15th and July 15th. Submit Proposals Here. Proposals to participate in Utopia School are reviewed on a rolling basis accompanied by open review potlucks where we gather together to look at proposed classes, eat together and get organized and inspired. Flux Factory’s 2014 Exhibitions program is supported in part by the New York City Department of Cultural Affairs in partnership with the City Council, the Andy Warhol Foundation for Visual Arts, and the New York State Council on the Arts with the support of Governor Andrew Cuomo and the New York State Legislature. Flux receives a grant from A Blade of Grass! Flux Factory is thrilled to be one of the initial recipients of a grant from A Blade of Grass. This year we have been awarded a one-time grant of $20,000 for general operating costs and capacity-building initiatives. Drinks are on us! We are excited to announce an OPEN CALL for our annual benefit! Flux Factory's Not-So-Silent Auction has become one of the best art parties of the year, and we're looking forward to making this one even more thrilling than the last. Tell us what you're interested in doing! Flux Factory welcomes its newest members to our Board of Directors, Jake Pratt and Jason David Brown. next post: 2014 Not-So-Silent Auction RAFFLE PRIZES!